Ole Kids - Were Cervantes and Shakespeare the same person? Were Cervantes and Shakespeare the same person? The 22nd April 2016 marked the 400th year anniversary of the death of Miguel de Cervantes, the greatest writer in Spanish Language and author of El Quijote. Isn’t it amazing Shakespeare died 11 days later (May 3rd) on the same year?! Spooky. I have heard in the past great theories about them actually being the same person. However a more likely theory which I read in a magazine by the British Spanish Society (also celebrating its 100 anniversary this year) is that Shakespeare co-wrote at least two plays with John Fletcher who was a Hispanophile. Fletcher would have known about Cervantes’ writing, and it is through this connection that Shakespeare’s writing may have been influenced by the Spanish writer. Even 400 years ago the ‘six degrees of separation’ theory must have worked! 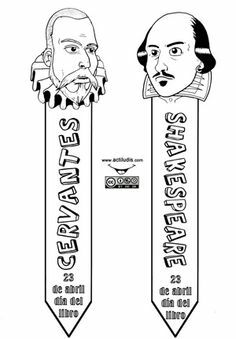 Download your Cervantes and Shakespeare bookmarks to celebrate their great genius. To celebrate the amazing legacy Cervantes has left us, we have collated some ideas you can do with the children to introduce them to the amazing adventures of El Quijote. If you want them to learn about Cervantes, we have found a slightly robotic video which explains his biography simply. It is a bit odd but cute.